Separated from the Southeastern coast of Africa, Madagascar’s isolation only adds to its appeal as a tour destination. It’s seclusion is the reason for the rare plants and animals who live here, many of which are found nowhere else in the world. Keep an eye peeled for the famed ring-tailed lemur as we explore the lush tropical rainforest on the Eastern side of the isle. And look out for other curious creatures along your trip: tomato frogs, dwarf chameleons, and hedgehog-like tenrecs – all unique to the country and so prolific that sightings are sure to happen. We meet at the hotel in Antananarivo, and if you arrive early, you're free to explore the rich cultural, historical, and architectural sites before gathering in early evening for a trip briefing and welcome dinner. We transfer to Antsirabe, a popular retreat since the late 1800s. We meet our bikes and go for a short ride at a leisurely pace with a variety of road conditions before we truly start exploring wild Madagascar. We explore the crater lakes of Andraikiba and Tritriva, both full of legends and mysteries. After, we have a picnic lunch by the spectacular Lake Tritrivia. We enjoy a long downhill back to our accommodation. The longest ride of the journey takes us to Ambositra to visit the Zafimaniry, an ethnic people living in the forested mountains and famous for their wood carvings, listed as part of UNESCO's Intangible Cultural Heritage. A van transfer takes us to Camp Robin, where we start riding. On a rural road, we pedal past rice paddies and through a spectacular valley with towering granite boulders to Ambohimahasoa before ending the day at Ranomafana National Park. We switch modes from biking to hiking and explore Ranomafana Nation-al Park, which is home to the golden bamboo lemur and more than 100 bird species, 30 of which alone are endemic to the country. We cycle past locals and observe rural life. There’s a 22-km off-road section with no vehicle support, but then we ride on a good gravel road to our hotel, with a visit to the Sahambavy Tea Estate, Madagascar's only tea plantation. Riding to Ambalavao, Madagascar's wine region, we take in captivating landscapes and stunning views of vineyards, terraced rice paddies, and rocky outcrops. If time allows we may visit a craft shop producing the well-known Antaimoro paper. Through the grassland dotted with enormous granite mountains, we bike to Anja with its bizarre cliff formations. We walk into the park before spending two nights in the Tsaranoro Valley. We start hiking at the edge of the granite Andringitra Massif, well-known for ring-tailed lemurs, bizarre cliffs, and other native animals and plants. At Chameleon Peak, we can appreciate stunning landscape of prairies and alpine patches. We bike across the Horombe Plateau to Ranohira. The landscape slowly changes into a wide-open savannah, and those wanting to cycle more can ride the last section to our lodge located at the foothills of I'Isalo National Park. We begin with a short ride to the starting point of our hike in I'Isalo National Park with its Jurassic-era landscape. 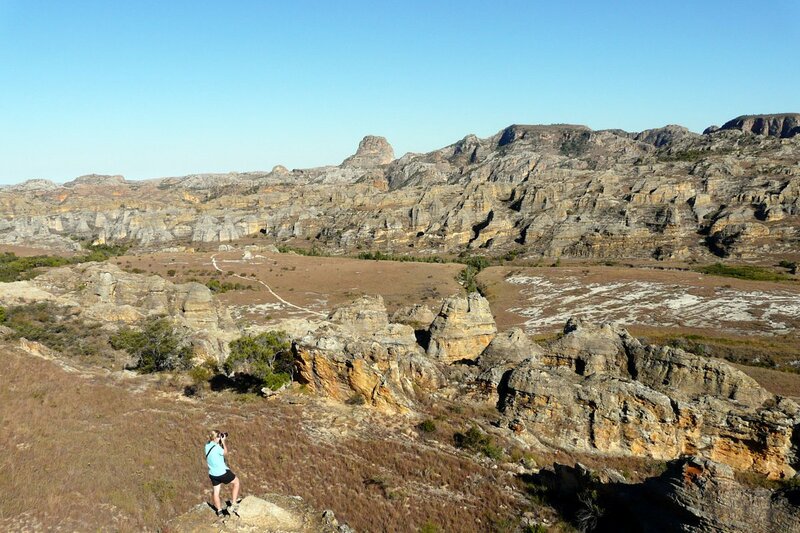 On the way, visit canyons and look for the ring-tailed, as well as other, lemurs that epitomise Madagascar. We continue cycling through the national park with rugged canyons and grassland to Ilakaka, famous for its sapphire deposits. Then transfer to the town of Toliara and overnight at a charming hotel just steps away from the deep blue sea. Enjoy the beach while sipping your favourite drink or get in the turquoise sea of the Indian Ocean and discover colourful marine life while snorkel-ling. We have a farewell dinner tonight to celebrate all that we have discovered together. Our tour ends after breakfast. We can help extend your stay or arrange an airport transfer. Day 3 - Antsirabe Loop Ride 54km. +569m. This was my first trip with SpiceRoads and I was not disappointed. Our fabulous guide Lucien, provided us with very healthy picnics and snacks every day. Lots of fresh vegetables, fruit, nuts and always lots of bottled water. He was also a font of knowledge on animal life, history, local people and local crafts. The Madagascar way of life is much different from anything I have experienced and I thoroughly enjoyed it. This was a challenging mix of on and off road cycling. I've never cycled off road before but I quite enjoyed the experience. My socks, however, will never be white again! Lucien and his crew took extremely good care of us and I highly recommend him. This was a wonderful trip with many stories to share with my family and friends. A lovely experience that challenged our riding skills, introduced us to a new country, and provided a wonderful full immersion into a vastly different culture and way of life from ours. Thank you for a very well organized trip. Can't recommend the crew too highly. We have used SpiceRoads many times for this reason, we have never been disappointed. Well done. Pleased with a great mix of cycling, experiencing the local culture and the foods of the country. The staff were very attentive to our health and safety while providing an excellent insight into the Malagasy people, history and culture. This journey is a multi-activity tour consisting of 519 km of riding and up to 50 km of hiking. This trip is recommended for confident and physically fit riders looking for a challenging experience with a variety of off-road activities. Although for some riders the journey may at first seem overwhelming, the rewards for your effort are priceless. It will also have lasting memories once you have made up your mind to get in the saddle, and those adventurous minds are sure to make the most of their time on this one-of-a-lifetime expedition. Suitability: The majority of this trip takes place off road, so we recommend that participants be physically fit and confident riding on rough terrain. In addition, as this cycling adventure is complimented by two days of hiking through rugged terrain, a moderate level of physical fitness will be an asset. Biking Conditions: The off-road portions of this trip are offset by flat tarmac and hard-packed roads. While the trails are generally smooth, some sections have loose gravel and sandy patches that could prove hazardous to riders. Additionally, as some of the descents can be rocky, extra caution is recommended. We meet at the hotel in Antananarivo, Madagascar's capital, known locally as Tana. Madagascar's capital takes its name from an episode in Malagasy history in which King Andrianjaka, who had his royal palace and stronghold constructed called One Thousand Warriors, named this city Antananarivo. If you arrive early, explore the rich cultural, historical, and architectural sites, but be warned there are hundreds of ancient stone steps to climb in this hillside city. We gather in the early evening for a trip briefing and welcome dinner. We transfer four hours to Antsirabe, 170 km south of Antananarivo, and on the way, stop to visit an aluminium pot making factory in Ambatolampy. The drive takes us along a gravel road in the highlands past rice paddies and fruit plantations, with smiling and friendly locals on bikes waving to us. Due to its geographical setting, Antsirabe and nearby thermal springs, at 1,370 m (4,500 ft) above sea level, has been a popular retreat since the late 1800s. Upon arrival in Antsirabe, we meet our bikes and go for a short ride at a leisurely pace with a variety of road conditions ranging from tarmac to back roads, along with some climbs and descents before we truly start exploring wild Madagascar. We spend the day exploring the region around Antsirabe with the highlight being the crater lakes of Andraikiba and Tritriva. Riding on paved and dirt roads with gentle undulations, we explore the first caldera located just 7 km west of the city. This former centre of water sports activities is believed to be haunted by a pregnant woman after she drowned herself many years back, and legend has it that she rests on a rock by the lakeside! We then continue by climbing through terraced rice paddies and on a single-track trail to Lake Tritriva, a glassy, 160-m deep body of water bordered by lush greenery. Nestled at 1880 m at the top of the towering Mount Tritriva, which gives the lake its name, the lake has an interesting and even strange character as the water drops during the monsoon season yet overflows during the dry months. This caldera is also teeming with myths and legends with the most prominent one being a love story about a couple named Rabbinically and Ravolahanta, who jumped off the cliff into the lake and drowned themselves, so they could be together forever. We have a picnic lunch by this spectacular yet mysterious place before hopping onto the bikes and enjoying a long downhill back to our accommodation. After breakfast, we cycle south on a hilly road to Ambositra in central Madagascar. Although today's ride is one of the longest of the journey, 95 km, the all-paved road makes the trip extremely pleasant as we pass many terraced rice paddies that harvested up to three times a year. Ambositra is home to the Zafimaniry, an ethnic people who live in the forested mountains southeast of the city and are famous for their wood carvings, listed as part of UNESCO's Intangible Cultural Heritage. We visit a Zafimaniry carpenter who will impress us first-hand with his carving skills that have been handed down for generations. A two-hour van transfer takes us to the small village of Camp Robin where we start our ride through fields and end at a lush rainforest. On a rural road, we pedal through a spectacular valley with towering granite boulders all the way to Ambohimahasoa, a small district with a quiltwork of fields and terraced rice paddies. After two climbs on a short tar section, we ride 20 km off road through more villages and eucalyptus forests until we reach the dense rainforest of Ranomafana National Park, with the last 10 km being a downhill to our lodge on the river. We switch modes from biking to hiking and explore Madagascar's most spectacular natural treasure, Ranomafana National Park, which is home to the golden bamboo lemur and more than 100 bird species, 30 of which alone are endemic to the country. Trekking through the dense rainforest, we will come across interesting, bizarre animals and plants found nowhere else in the world. We will also be drawn by rare birds and many species of lemur, and if lucky, we might spot one or two golden bamboo lemurs, now threatened with extinction. Depending on where the lemurs are, our hike will vary from 4 to 6 hours and between 10-12 km. We stop for lunch at a local restaurant, and then the afternoon is free for you to visit the peaceful village of Ranomafana or relax your muscles in the nearby thermal springs. In the evening, we take an easy night walk in the park to spot nocturnal animals, such as the mouse lemur and the striped civet. Rise early and after breakfast, we have short drive back up the hill to have an easier start to our day. During today's ride, we'll be off road for 22 km and due to bridges being out, our support vehicle cannot follow. Once we meet up again, we have a picnic lunch amongst the tea plants the Sahambavy Tea Estate, the only tea plantation in Madagascar. Set in a stunning valley beside Lake Sahambavy, the estate was created in 1970 and produces large quantities of tea both for export to Mombasa in Kenya and for local consumption. We overnight in charming bungalows set amidst a lovely garden and overlooking a glassy lake. Following a delightful breakfast, we take a short transfer to the city of Fianarantsoa, where you have time for a bit of shopping before we continue southward to Ambalavao by bike. Fianarantsoa is the capital of the Betsileo ethnic group who inhabits the highlands of Madagascar. The landscape is again captivating with undulations and breath-taking views of vineyards, terraced rice paddies, and rocky outcrops. We then pedal further with a 10-km downhill to compensate for the climb up to Ambalavao, the wine region of Madagascar and a beautiful town with brightly painted buildings. Upon arrival, if time allows, we may visit a craft shop which produces the well-known Antaimoro paper, hand-crafted papyrus. We leave the market town of Ambalavao and get in the saddle for another day of riding further south. While cruising, you will notice the landscape gradually changing into open grassland savannah dotted with enormous granite mountains. Bizarre formations of towering cliffs await us in the small natural reserve of Anja, along with superb scenery, exotic plants, caves, tombs, and ring-tailed lemurs. We take an hour walk into the park before we leave the road cutting through the Tsaranoro Valley of the Andringitra Range. Our 20 km off-road effort is rewarded with our delightful accommodation complete with a natural swimming pool. We start our hiking day at the edge of the granite Andringitra Massif, a rugged range that has over the years become a hiking paradise. It was formed by an abrupt volcanic event that took place millions of years ago. The range is well-known not only for the world-famous ring-tailed lemur, but also for its bizarre yet stunning rugged landscape, charming pastoral culture, and variety of native animals and plants. Due to its rich biodiversity, Andringitra was declared a nature reserve in 1927 and, 60 years later, a national park. Once we reach Chameleon Peak, we can appreciate panoramic views over this rocky highland with a stunning landscape of prairies and alpine patches. Our hike will take 4-6 hours, and we have the afternoon free for a swim and to try and catch sight of ring-tail lemurs as they pass through camp. We transfer (4 hours) back to the paved road to Ankaramena. This place is well-known for its sweet and juicy mangoes and papayas, and after a short fruit break, we continue the drive to lunch shortly after we pass Ihosy. Here we start our ride downhill across the vast Horombe Plateau towards Ranohira. You will notice the landscape slowly transforming into a wide-open savannah. Dry grass glows in the beaming sun, and the distances between villages become longer. In this region, there is mostly the ethnic group of Barra people who live and breed Zebu cattle. The first 50 km of today's ride are flat and then the hills begin 25 km before we reach the town of Ranohira. Our lodge is located at the base of Isalo National Park and have a perfect view for sunset. I'Isalo is a vast region of wind-polished and water-scoured rock towers, deep canyons, gorges, and oases. This huge mountain range is spectacular with its ventifacts, eroded sandstone boulders caused by wind. Our adventure begins with a short bike ride to the starting point of our hike in I'Isalo National Park. In this exotic park, we trek through its captivating Jurassic-era landscapes formed by millions of years of erosion. 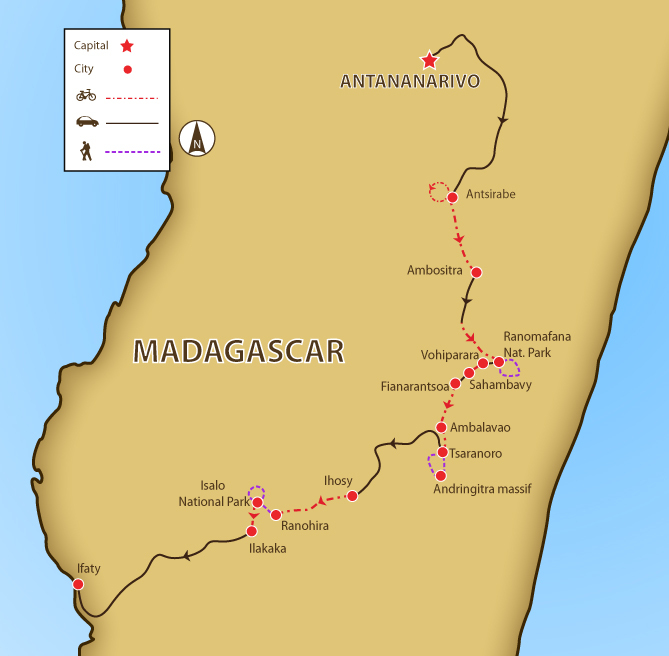 On the way, we visit canyons, looking for the ring-tailed lemur, as well as other lemurs that epitomise Madagascar. We can refresh ourselves on the way at a waterfall or take a dip in a natural pool. A catered picnic lunch will give us enough energy to carry on up the canyon to see the blue and black natural pools. After the walk of 4-6 hours, we transfer back to the hotel. After breakfast, we continue cycling through the national park with a view on sandstone formations, rugged canyons, and grasslands to the town of Ilakaka, famous globally for its world-class alluvial sapphire deposits. After our morning cycle, we load the bikes for a transfer of approximately 5 hours by van, with a stop for a picnic lunch, to reach the coastal town of Toliara in the afternoon. Home to the Vezo, a well-known maritime people, Toliara is also a most important trade centre in southern Madagascar. We overnight at a charming hotel elegantly located on the Bay of Ifaty and just steps away from the deep blue sea. After the long journey, it's time for us to rest our legs and enjoy our well-deserved reward for our determination, the beach! Soaking up the warm sun and balmy sky, you can lie on the beach while sipping your favourite drink or get in the turquoise water of the Indian Ocean for a swim to refresh yourself and drive off the heat. At the coral reef right before your eyes, discover colourful marine life while snorkelling. If you would like to learn more about unique plant life, don't forget to take a walk through the nearby natural reserve known for its variety of didierraceae, adasonia, euphorbia, and baobab trees. We have a farewell dinner tonight to celebrate all that we have discovered together. Our tour ends after breakfast, but we can assist you in extending your holiday on the beach or help to arrange a transfer to the airport for your onward flight. Because some people can't imagine going on a trip without their own beloved bicycle, we do not provide them as part of this tour. However, you can hire bikes locally for the price listed in the tour pricing section. The bikes are Carraro mountain bikes with lightweight alloy frames, 24- to 27-speed gearing, v-brakes, and Shimano components and front suspension. If you bring your own bike, please make sure it is a mountain bike, preferably with front suspension, in good mechanical order. A valid passport and visa are required for all nationalities to enter Madagascar. However, for those staying fewer than 30 days a visa on arrival can be obtained at the Antananarivo Airport for 35USD, provided that their passport is valid at least six months from the date of entry. Please go here for more information. No vaccinations are required. However, it is encouraged to consult your physician if you need any preventive medication before you travel. Meals are included as per the itinerary where B = breakfast, L = lunch, D = dinner. Malagasy cuisine incorporates many ingredients and culinary techniques in its dishes that reflect Southeast Asian, African and European influences. With rice as the main staple most meals consist of local dishes that include curries, soups, and salads, and we will make sure you sample as much variety as possible. Be sure to try Akoho Sy Voanio, a chicken dish made juicy and aromatic with coconut, tomato, onion, garlic and ginger. Any special dietary requirements can also be catered for as well. Please let us know at the time of booking. Keeping you completely hydrated is a job we take very seriously. Cold water, some energy-restoring local fruit and soft drinks are included in the tour price while riding. Soft drinks and other beverages during meals are not included. Beer is freely available everywhere in Madagascar, but is NOT included in the price. We recommend that you tuck away a few extra dollars, perhaps US$20, for incidentals. It is customary to tip local tour guides and drivers, however, the amount you give should be dependent on the level of service you receive. Madagascar's currency is the Malagasy ariary (AR) and is used throughout the country. Euros are also widely accepted, with US dollars occasionally accepted in the capital, major cities and tourist attractions. However, while ATMs are available in Antananarivo and other major towns, you are allowed to draw only around €150 per transaction. In addition, as credit cards are not widely accepted except at a few luxury hotels, upscale restaurants, Air Madagascar offices and travel agencies, it is recommended you have enough cash on hand. The most useful card is Visa, with MasterCard welcomed only in some stores. Visa and MasterCard can also be used to get cash advances (in ariary) at the banks which also change travellers cheques and cash in major currencies. Ivato Airport also has a foreign-exchange counter offering exchange rates as good as those at the banks, and is quite convenient for tourists upon their arrival to the country, but be sure to count your money immediately so that you haven’t been short changed as there have been a number of reports of fraud committed by its staff.